5,000 B.C. TO 3,000 B.C. The Sub-Sahara region of Africa has produced some of the most skillfully made arrow points. A multitude of different types of have been found there. They are being recovered on sites in Mali, Burkina Faso, Niger and Chad. One of the most artistic of these is called a Fan-Eared point. The name is descriptive of the long narrow barbs they have in varying lengths and angles. Fan-Eared points have been reported from Mali and Niger. Stone arrow heads from the Sub-Sahara region of Africa were made in almost every imaginable shape. The most impressive (artistic) examples are also the ones that required the most skill to manufacture. It's doubtful that everyone making stone arrow points during the Neolithic period would have had this skill level. But a few craftsmen seem to have taken stone arrow point making to the highest level in this region of Africa. Some of the better examples have oblique transverse pressure flaking. Others, like the Fan-Eared points have extremely long delicate "ears" or barbs and "needle" points. Fan-Eared points are so "delicately" made that it's possible they were never meant to be used for hunting. Some of them may have been made for special uses such as burial offerings to the dead. If fan-eared points were domestically used, some of them have the appearance of being too fragile for that purpose. An ear or point would most certainly have broken after striking anything. Fan-Eared points seem suspiciously elaborate for normal use. But that doesn't mean they weren't used for that purpose. 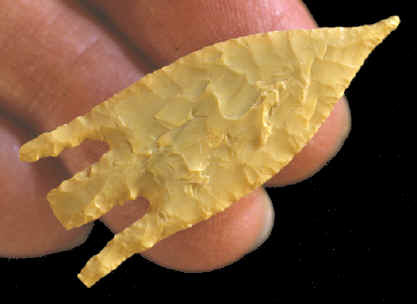 There were other cultures in the world that also made "fancy" projectile points for hunting. This Fan-Eared point is a classic example. It has a needle point, recurved blade edges and deep notches that form long narrow outward flaring barbs. It's also nicely flaked on both sides and fairly thin. This point is made of a beautiful piece of yellow chert of good quality and measures 1 11/16 inches (4.3 cm) long and 1/8 inch (2.3mm) thick. 1971, Clark, J. Desmond, "The Horizon History of Africa---African Beginnings," p. 31. 2003, Overstreet, Robert M., "Indian Arrowheads," pp. 1315-1317.